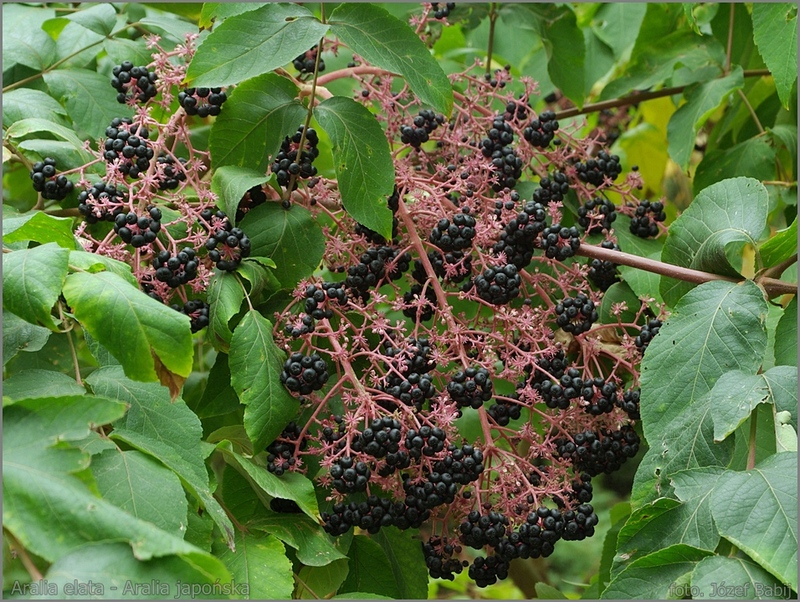 Aralia elata is a shrub or small tree to 10 m tall, stems very spiny, stout, sparsely branched, colonial from root sprouts, forms thickets, leaf scars large, narrow, extending more than half way around stem, vein scars five or more in a row within leaf scar not as prickly as A. spinosa. Leaves alternate, 40-80 cm long, 1-3 times pinnate, leaflets 6-12 cm long, distinctly stalked, slightly hairy below, veins run to ends of teeth, do not join near edge, margin broadly toothed. 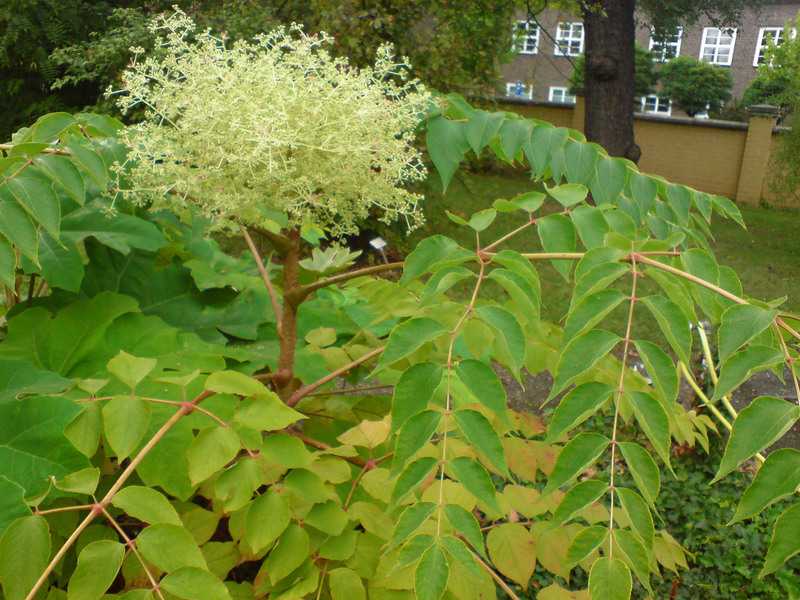 Flowers greenish-white, small; inflorescence of large, branched clusters, on a short axis, branches 30-45 cm long, July-Aug.
Aralia elata (Japanese angelica) fruit. plantsgallery.blogspot.com (Accessed 9/2017). Fruit black, ripens Aug.-Oct., 2-5 seeded berries. Fruit eaten by birds and small mammals. Habitat: Forest understories, disturbed woodlands, escaped from cultivation (Dirr 1990; Greller et al. 1991). Found in forest soil pH 5.0 (Gargiullo unpublished data). prickles thought to deter damage by herbivores (Briand and Soros 2001). Notes: Often mistaken for A. spinosa (devil’s walking stick) , a species native to the southern US. It is likely that there is no A. spinosa in NYC (Steven Glenn personal communication). Aralia spinosa has leaves with leaflets 5-8 cm long, margins finely toothed, veins join near ends of leaf teeth, and an inflorescence with main axis elongate and branches 20-35 cm long.